Having a good, strong and likeminded community around you is the bedrock of a successful podcast. Working out the best way to build such an audience may seem like a huge mountain to climb, particularly if you are new to the podcasting world. 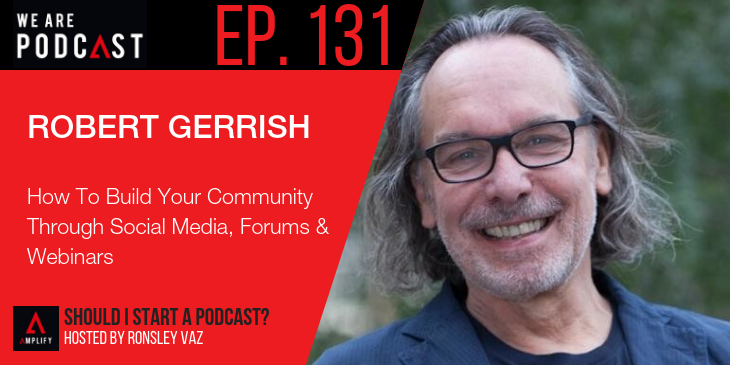 Luckily, we have the community building tycoon, Robert Gerrish on this week’s episode of Should I Start a Podcast, giving his keynote speech from We Are Podcast, 2015. Robert is one of those guys who adores small businesses and creative entrepreneurs, that’s why his career has always revolved around helping companies to succeed. He dabbled in multiple ventures – including music and art projects before deciding to jump ship, and move to hotter climbs, swapping London for Sydney. He co-authored the business bestseller, Flying Solo: How to go it alone in business, and developed his own agency, Flying Solo, Australia’s micro and solo business community which currently has over 100,000 members. In this episode, Robert, introduces the novel idea of actually enjoying what you do for a living, as well as how to build a nice, solid community around your business. Why Facebook groups, webinars and forums are great community building tools. How understanding your podcast voice will get the people you need on your side. Why taking your time getting things wrong can benefit you in the long-run. Why over delivering is a great way to maintain your audience. How growing your profile using online forums will improve your understanding of your audience. How respect is a key ingredient to running a solid community. Ways to use your podcast as a research tool of your audience and their needs. Why having smaller audience numbers is okay. Why slowing down can improve your show. How sticking with it takes courage. Why you are guaranteed to do mediocre work, but that’s okay. Why responding on blogs will grow your confidence. How to own your community.